In 1950, Dr. Seuss published a book called “If I Ran the Zoo.” It contained the sentence: “I’ll sail to Ka-Troo, and bring back an IT-KUTCH, a PREEP, and a PROO, a NERKLE, a NERD, and a SEERSUCKER, too!” According to the psychologist David Anderegg, that’s believed to be the first printed use of the word “nerd” in modern English. The next year, Newsweek noticed that nerd was being used in Detroit as a substitute for “square.” But, as Ander-egg writes in his book, “Nerds,” the term didn’t really blossom onto mass consciousness until The Fonz used it in “Happy Days” in the mid- to late-1970s. And thus began what you might call the ascent of nerdism in modern America. 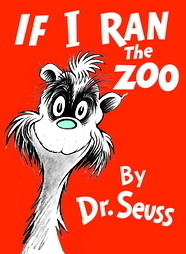 In the book, Gerald McGrew is a kid who, when visiting a zoo, finds that the exotic animals are "not good enough". He says that if he ran the zoo, he would let all of the current animals free and find new, more bizarre and exotic ones. Throughout the book he lists these creatures, starting with a lion with ten feet and escalating to more imaginative (and imaginary) creatures, such as the Fizza-ma-Wizza-ma-Dill, "the world's biggest bird from the island of Gwark, who eats only pine trees, and spits out the bark." The illustrations also grow wilder as McGrew imagines going to increasingly remote and exotic habitats and capturing each fanciful creature, and brings them all back to a zoo now filled with his wild new animals. He also imagines the praise he receives from others, who are amazed at his "new Zoo, McGrew Zoo"